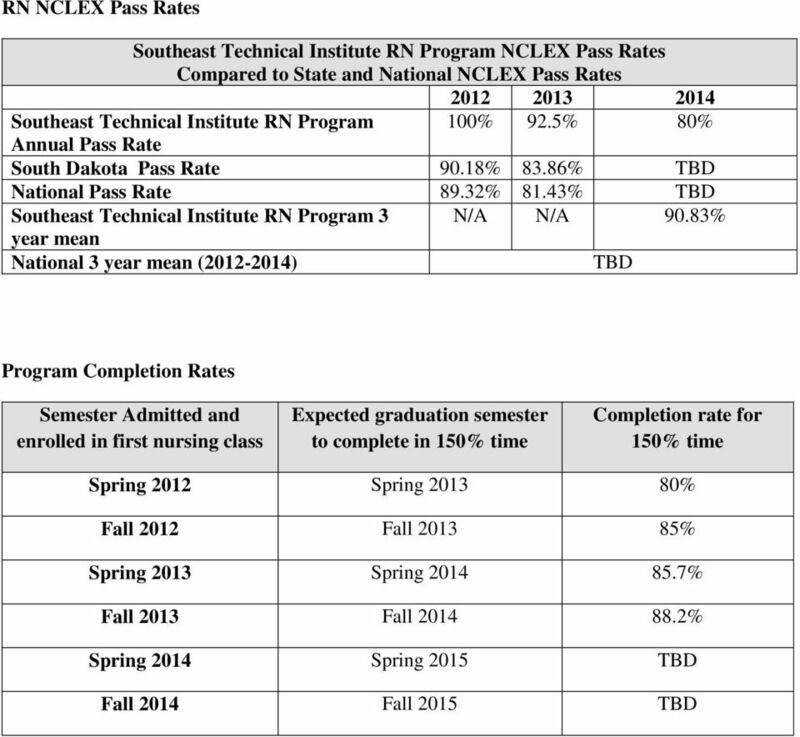 Download "RN NCLEX Pass Rates TBD. National 3 year mean (2012-2014) Program Completion Rates. 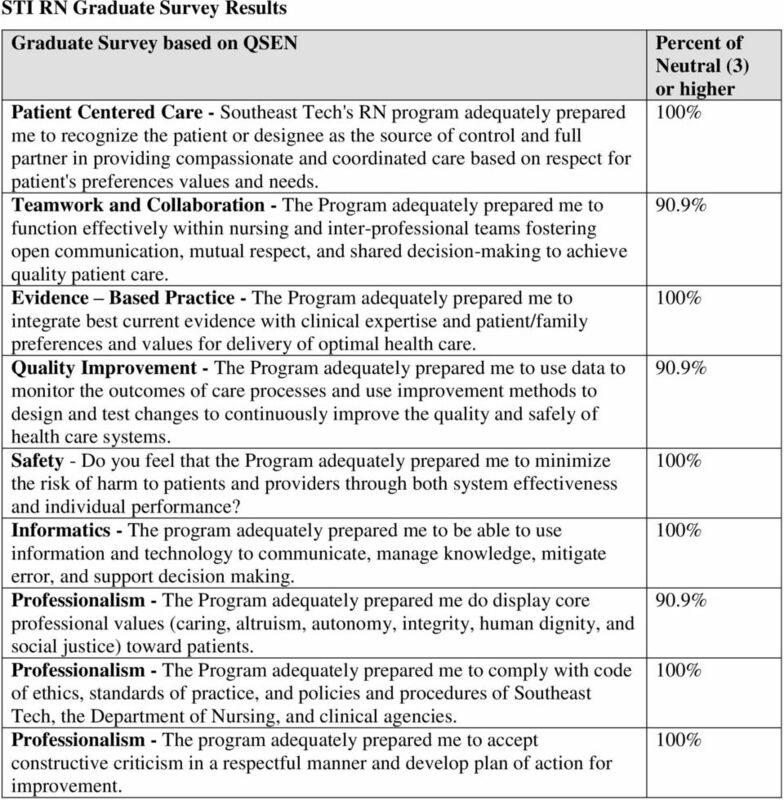 Semester Admitted and enrolled in first nursing class"
3 Employer Survey Results Employer Survey based on QSEN Patient Centered Care The graduate formulates an individualized plan of care for the patient and family with a focus on assessment and planning utilizing the nursing process. The graduate integrates caring behaviors with a positive attitude while respecting the diversity of individuals Total Percent of satisfactory or higher The graduate performs a safe and accurate assessment. Teamwork The graduate practices continuous improvement of own conflict resolution skills. The graduate formulates effective communication skills with the patient and/or family. 83.3% The graduate communicates relevant patient data in report. The graduate manages appropriate relationships with team members The graduate accepts constructive criticism in a respectful manner and develops a plan of action for improvement. 90% Evidenced Based Practice The graduate empowers patients and/or families in all aspects of the health care process. 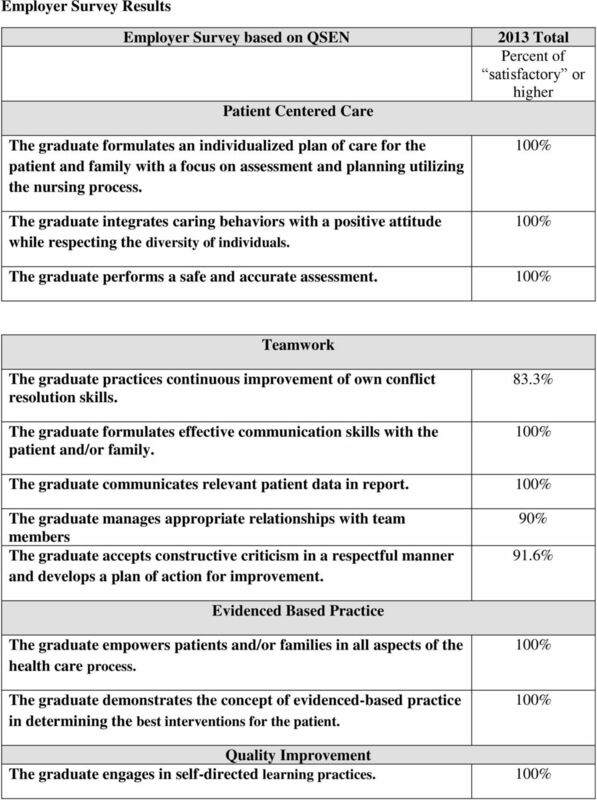 The graduate demonstrates the concept of evidenced-based practice in determining the best interventions for the patient. Quality Improvement The graduate engages in self-directed learning practices. 4 The graduate complies with policies and procedure of the employing institution. Safety The graduate implements delivery of care in a timely/cost-effective manner optimizing patient outcomes. The graduate formulates interventions to improve safety hazards and concerns to patient's, families, and/or the health care team. 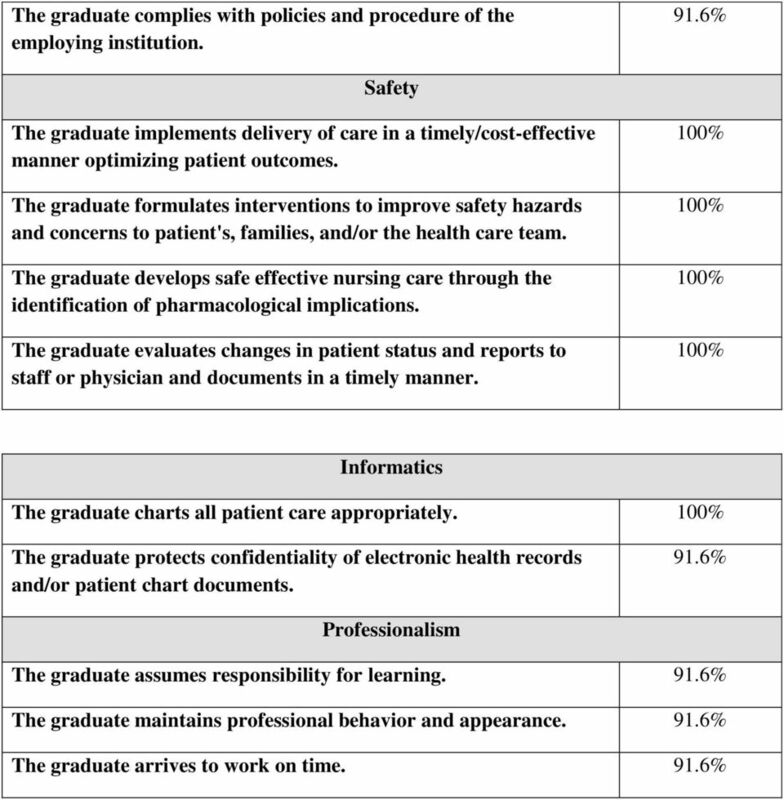 The graduate develops safe effective nursing care through the identification of pharmacological implications. The graduate evaluates changes in patient status and reports to staff or physician and documents in a timely manner. Informatics The graduate charts all patient care appropriately. The graduate protects confidentiality of electronic health records and/or patient chart documents. Professionalism The graduate assumes responsibility for learning. The graduate maintains professional behavior and appearance. The graduate arrives to work on time. Name of Academic Program and School- Baccalaureate in Nursing (BSN), College of Engineering, Education and Professional Studies (CEEPS) Plan Developed By: Nursing Faculty 6-14-2012 Primary Contact: Dr.
Our Mission To prepare and inspire students for success and for thoughtful engagement in the world. Biola University NURSING, B.S. Mission The mission of the Department of Nursing is to prepare students to be competent nursing professionals who integrate Christian caring into their nursing practice.